The Superman Fan Podcast: Episode 316 Part I: Superman Family Comic Cover Dated December 1960: Superman's Pal Jimmy Olsen #49! Episode 316 Part I: Superman Family Comic Cover Dated December 1960: Superman's Pal Jimmy Olsen #49! Superman's Pal Jimmy Olsen 49! Download Episode 316 Part I! 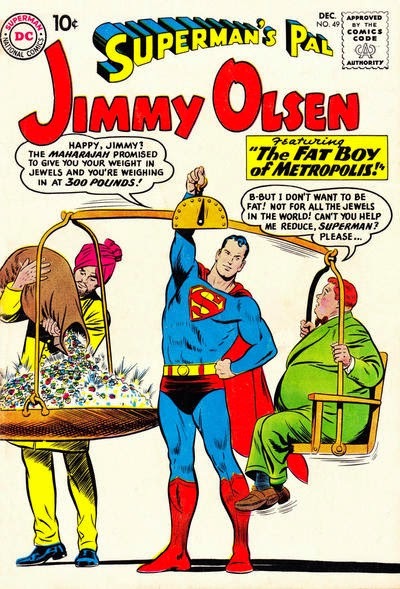 SUPERMAN'S PAL JIMMY OLSEN 49, December 1960, was published on October 6, 1960. It contained 32 pages for the cover price of 10¢. The editor was Mort Weisinger, and the cover was pencilled by Curt Swan and inked by Stan Kaye. It featured the issue's second of three stories. All three stories have been reprinted in SHOWCASE PRESENTS: SUPERMAN FAMILY vol. II. - JIMMY'S GORILLA IDENTITY (11 pgs. ), writer unknown, was pencilled by Curt Swan and inked by Stan Kaye. This was Jimmy's 14th transformation, and his second as a gorilla (after issue 24, covered in Episode 227 for the week of Wednesday, May 23, 2012). - THE FAT BOY OF METROPOLIS (8 pgs. ), writer unknown, was pencilled by Curt Swan and inked by John Forte. This was Olsen's 15th transformation, also reprinted in SUPERMAN: THE STRANGE TRANSFORMATIONS OF JIMMY OLSEN. - ALIAS, CHIP O'DOOLE (7 pgs. ), written by Jerry Siegel, pencilled by Curt Swan and inked by John Forte. This story was also reprinted in SUPERMAN'S PAL JIMMY OLSEN 95 (80 Pg. Giant), August/September 1966, published on June 14, 1966. Also highlighted in this episode are the issue's ads and other features, including JIMMY OLSEN'S PEN PALS letter column. Next Episode: SUPERMAN FAMILY COMIC BOOK COVER DATED DECEMBER 1960 PART II: WORLD'S FINEST COMICS 14! In 2 Weeks: SUPERMAN COMIC BOOK COVER DATED NOVEMBER 1963 PART I: SUPERMAN 165! In 3 Weeks: SUPERMAN COMIC BOOK COVER DATED NOVEMBER 1963 PART II: ACTION COMICS 306! In 1 Month: SUPERMAN FAMILY COMIC BOOK COVER DATED JANUARY 1961: SUPERMAN'S GIRL FRIEND LOIS LANE 22!